ELMA object model is a set of classes, entities, enumerations, that can be used to define the business logic of the application. Under entity, a database object is implied. The main classes for working with the object model are located in the EleWise.ELMA.SDK assembly (EleWise.ELMA.Model namespace). Components of ELMA object model are described below. Generally, metadata is a set of data items. Each item describes a specific element of the object model (e.g. entity type, enumeration). You can use ELMA plugin for Visual Studio to create new types of entities. Main types of metadata are located in the EleWise.ELMA.Model.Metadata namespace. Metadata files have .md format (in fact, these are common XML files). All changes to the database are done within transactions. You can mark a manager’s method with TransationAttribute to make sure that the transaction will be committed after the method is executed. A manager is a service used to interact with the object model elements. Usually, we use managers to work with entities (for more info see Entity managers). In ELMA, you can extend the object model. This allows creating additional modules with their own entities or adding properties to entities from other modules. This is possible because in ELMA extendable interfaces for entities are used (for more info see Entities). 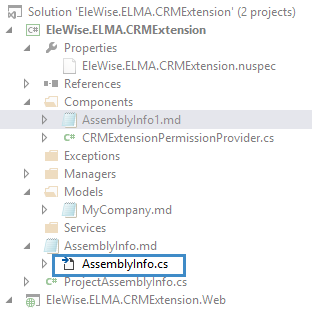 You can create objects in any assembly with the EleWise.ELMA.Model.Attributes.ModelAssemblyAttribute attribute. There is a service for working with metadata: EleWise.ELMA.Model.Services.IMetadataRuntimeService. Please check its description in API help.